Children who need baby crowns to restore their teeth often choose to see a pediatric dentist. PDG offers both white- or tooth-colored pediatric crowns as well as silver, stainless steel crowns for first molars and front teeth. For second baby molars, only silver is available. Since the enamel of baby teeth is thinner, cavities tend to spread more easily and eventually come to affect a larger area of the tooth. 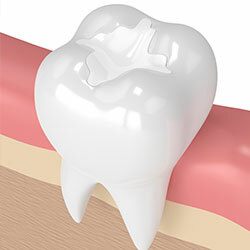 At that point, crowns may be the only way to protect the tooth from premature extraction. Baby teeth that show evidence of extensive decay, with two or more surfaces affected, can sometimes be saved through the use of a crown. Occasionally, especially in aesthetic areas, it is possible to use a tooth-colored crown. These crowns can be used to protect front teeth when they become cracked or chipped, have undergone root canal therapy, show signs of decay, or are markedly discolored. In particular, if the decay or cavity has spread to different surfaces of the tooth or reached the pulp of the tooth, a baby root canal may need to be performed. At that point, the tooth becomes weaker and is more likely to crack. In these instances, it is important to protect the tooth by using a crown. In general, for front teeth we recommend using tooth-colored crowns with or without a silver coping underneath. These crowns are both aesthetic and strong. Tooth-colored options are also available for some back teeth, but for baby molars that are constantly exposed to chewing and grinding, silver stainless-steel crowns may be a better option. After the child is made completely numb using local anesthesia, all of the affected tooth structure is removed so as to get rid of any decay. Then the tooth is prepared in a certain way so a prefabricated crown can fit on top. When a pediatric dentist has determined the size of the crown that would fit best for the tooth, the crown is cemented in place. Immediately after treatment, it is vital that the child does not eat anything too hard or sticky. Chips and popcorn pieces can get stuck under the crown, and make it uncomfortable. Also, sticky or hard candies, like bubble gum, can displace the crown. If a crown gets displaced, the child should be brought back to the dental office to have it re-cemented. To prevent this from happening, however, parents should be careful about what the child eats after treatment. Often, we recommend softer foods. Also, sometimes the gums may become slightly irritated by the new crown. It is important to continue to brush around the gums of these teeth to prevent further irritation.